Edmonds, who also played baseball, was used as a wide receiver and running back in college, gaining 1481 yards from scrimmage (755 rushing, 726 pass receiving) and averaging 10.3 yards on 93 punt returns. He was chosen by the Seahawks in the fifth round of the 1986 NFL draft with the hope that, with his speed and sure-handedness, he would provide an upgrade to the team’s kick return game. Seahawks went 10-6 to finish third in the AFC West while leading the conference in punt return average (11.7). 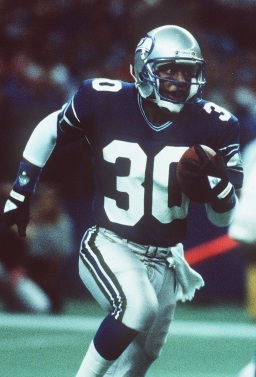 Edmonds was near the top with a 12.6-yard average on 20 punt returns during the strike-interrupted 1987 season and followed up with a punt return average of 9.7 yards in ’88 along with 22.5 yards on 40 kickoff returns. He signed as a free agent with the Detroit Lions in 1989 and also tried his hand at baseball during the Spring with the Class AA Reading Phillies. Shifted to wide receiver and a poor fit in Detroit’s new run-and-shoot offense, he was cut in the preseason, signed with the Raiders, and appeared in seven games, averaging 10.5 yards on 16 punt returns and 19.4 yards returning 14 kickoffs, but a broken ankle finished his season and he was released afterward. It brought an end initially to his NFL career due to off-field problems and concerns about his injury, but he returned with the Tampa Bay Buccaneers in 1995 at age 31 and averaged 10.1 yards on 29 punt returns and 19.8 yards running back 58 kickoffs. Overall, Edmonds averaged 11.0 yards on 134 punt returns and 21.1 yards on 173 kickoff returns, with 89 punt returns for an 11.3-yard average and 101 kickoff returns for a 22.1-yard average coming with the Seahawks.